We went to see American Sniper at the movie theater this weekend and I was a bit anxious for reasons much different from my Husband. The first couple of theaters were sold out and we finally found one with tickets still available. We grabbed popcorn and stood in line outside of the theater until they allowed us in for seating. Waiting in line is a thing in itself with my Husband. It is a winding line, that causes people to stand closely together. People who tend to get anxious on their own and irritated from standing in line. They breathe close to my Husband, they bump into him accidentally, someone might make a sudden movement or make a loud noise. I’m thankful we are positioned in such a way so that he can turn his back into a corner (not to a person) and the exit door of the theater is 10 feet behind us. We have 45 minutes to wait before we even enter the theater. I also know he has a can of chew in his right jeans pocket and an empty water bottle in the inside of his jacket on the left side. It will be a miracle if he makes it until the beginning of the movie before he is desperately reaching for them both because you know, line. Once inside, he is able to sit on the end of a row and I sit on the inside. Because we know it is sold out our seating situation becomes more complicated than normal. I pray no one obnoxious sits behind us, like the guy who was behind us in line. I thought my Husband might deck him for commenting on a soldier in line, further behind us, who had a service dog. These people felt inconvenienced for going to a movie with a dog in the same theater. I look around and wonder how many other people are like us and have these seating problems? What other wife has a jumpy Husband next to her? How many veterans are sitting in this same theater scanning the room, memorizing their surroundings in a way much different from a civilian? Like I said, I was anxious for this movie for reasons separate from my Husband. He was anxious because after 12 years in the Army and 2 tours in Iraq he has PTSD. And here we were, going to a movie about the same war that was sure to kick his PTSD in high gear. I was nervous he wasn’t going to be able to make it through the whole movie, I was nervous his regular PTSD issues were going to affect him times 10, just knowing what we were about to see. Once the movie started he lasted about 20 minutes before he reached for his chew, empty bottle, and my hand. It was about the same time that Chris Kyle reached for his chew, in a scene, in the movie. While there were many times I heard my Husband hold his breath, adjust uncomfortably in his seat and squeeze my hand a bit too hard, he made it through the entire movie without walking out. I nodded my head through out the entire movie as they showed scenes that clearly depicted issues that our soldiers have when they come back, issues that my Husband has daily. The standing in line thing wasn’t because of the movie, no, that was just normal stuff. The seating, also normal. This is our normal. These are the situations that we both automatically think about everyday when we go places or have people to our home, that most people never would realize we think about. These are the situations that we have to think ahead on so my Husband doesn’t get into a position that he is uncomfortable by. And then when his anxiety gets worse he, thankfully, knows his coping mechanisms quite well. 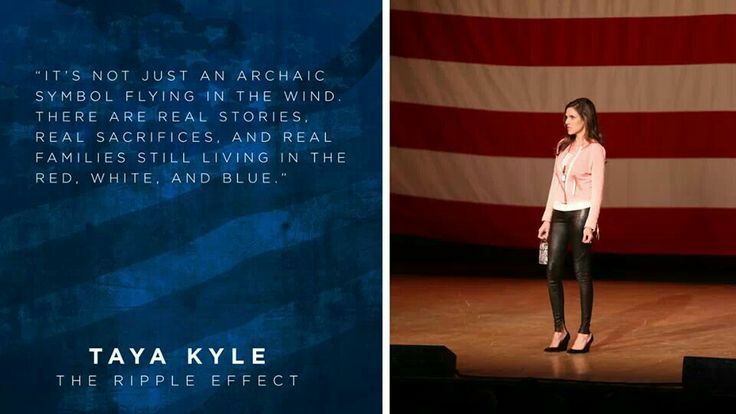 I am so thankful to Chris Kyle, not only for his service, but for sharing his story when he was alive. I am also grateful for his wife for now continuing his story and their story. It isn’t just about the soldier but it is also about the people standing behind them. I’m not a political person and will rarely share my view on whatever topic is occupying CNN but I will say I really appreciate this movie showing the other side of war. For once it isn’t just showing the hero walking off into the sunset but it is showing how that hero is really affected and how his life is forever altered. And while I know some are discussing whether or not this man is a true hero, I say he is. He did his job, he did it well and he saved countless American lives. We left the movie theater and it was dark out so I drove. We went somewhere for dinner so I could have a drink that involved vodka because well, holy intense movie. Waiting for our table, we sat at the bar where a guy the Hubby knew came up behind him and smacked him a hello on the back. The Hubby jumped extra high and I rolled my eyes at the clueless other man. When we were able finally to be seated, we annoyed the waitress by having to move around so he wasn’t positioned against a large group of people and knew where the door was. Once we were finally settled he ordered a soda because he quit drinking alcohol awhile ago. This is our life. It is a daily dance, our way of living. It is a dance that many of the men and women he was deployed with do as well. Some handle it better than others. Some acknowledge more than others. As far as our household, we will probably always live like this because it is now the only way we know how. It truly was a good/sad movie and I have the upmost respect for our soldiers! I also completely understand about all of the stuff, my husband is a cop and does the exact same stuff. Tell your man THANK YOU! Bellaball, Thank you. I know a lot of cops that experience a lot of the same problems. So tough! Thank you for sharing your story! Sometimes you feel like you live in your own made up PTSD world. Good for you to both understand what your Husband needs to make life easier. It takes a team effort!